I’ve passed the new Shredded Wheat Multigrain Rye & Quinoa packs a few times in various supermarkets, but haven't bought them because I'm trying to retrain my kids into choosing porridge in the morning. But I'm not having much luck as most often they just want cold, crunchy cereal. However, on this particular shopping trip, I succumbed to price when I noticed them being sold in Poundland. So into the basket they went and home for review. 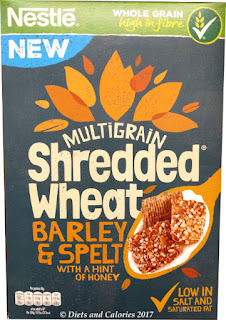 My kids adore Honey Nut Shredded Wheat which is why I thought they might like these. But I don’t often buy them because of the sugar content. 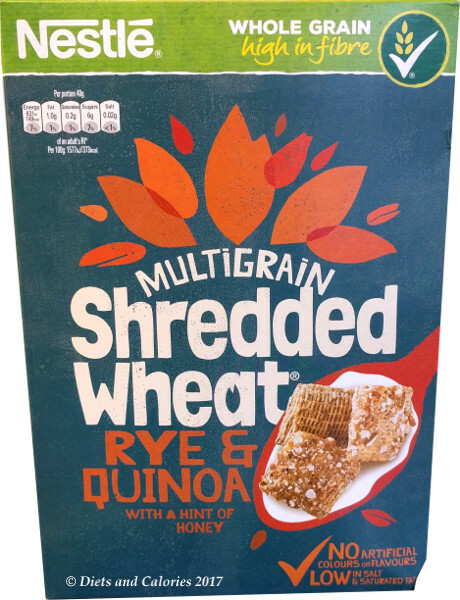 The first thing my younger daughter said when she saw them was ‘ooh yuck, quinoa.’ She knows all about quinoa as I’ve tried many times to persuade to to try some of my tasty quinoa creations, but she refuses. But, once I pointed out all the different types of sugar in them (yes, one type of sugar doesn’t seem to be enough in this cereal), she was more inclined to give them a go. 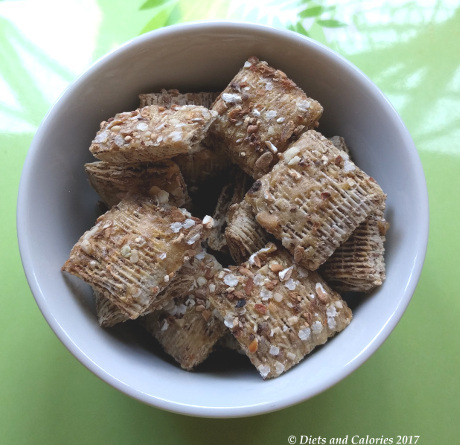 Shredded Wheat Multigrain is made predominantly from wheat (84.6%) with 6.3% Rye and 3.2% quinoa flakes, so they’re still mainly wheat. They also contain peanuts which is why I thought they may taste like Honey Nut Shredded Wheat. I poured out a few into a small bowl and nibbled on a few dry pieces. 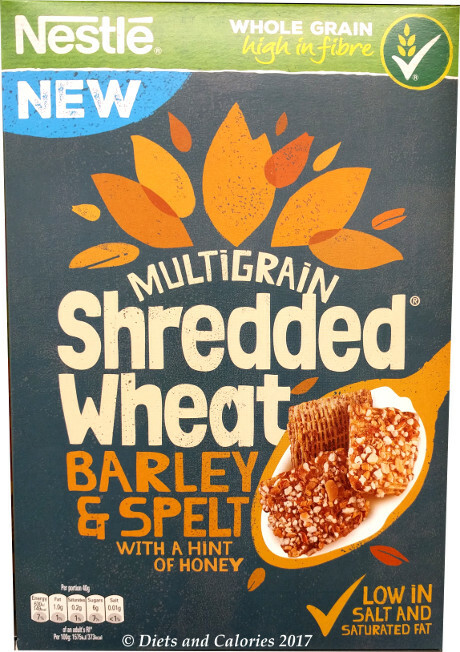 They’re a bit darker in colour than regular Shredded Wheat and not as sweet tasting as Honey Nut Shredded wheat. I could detect the rye taste (I’m not crazy about the taste of rye) but it wasn’t the dominant flavour in any way. The nuts provide a bit of added crunch. 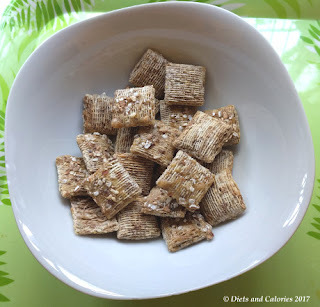 I initially thought the shredded wheat part must be mixed with rye and quinoa, but on closer inspection, it looks like each shredded wheat is sprinkled with rye and quinoa flakes and teensy bits of peanut. My daughter agreed they weren’t as sweet and easily overcame her mistrust of the quinoa, admitting she couldn’t taste it at all. Looking at a nutritional comparison between these and Honey Nut Shredded Wheat, surprisingly they both contain 15g of sugar per 100g. The box size is 475g which should provide 11 servings. But not in my house! If I’m lucky, the box will last for about 6 servings. I took photos of the recommended serving size of 40g which equates to exactly 22 shredded wheat pieces. 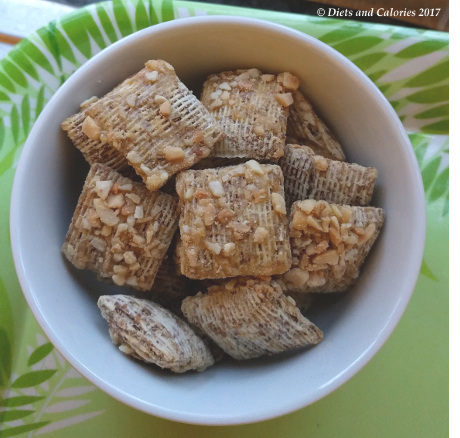 One photo shows what 40g looks like in a rice bowl and the other in a regular sized cereal bowl. 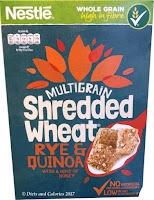 Shredded Wheat Multigrain Rye & Quinoa is very low in salt, low in fat and saturated fat. It provides a good amount of fibre and protein and sugar is in the medium level whereby each 40g serving provides 6g of sugar (about 1.5 teaspoons) without milk. Nutrition information per 100g: 373 calories, 2.5g fat, 0.5g saturated fat 72g carbohydrates, 15g sugars, 10g fibre, 11g protein, 0.05g salt. Ingredients: Cereal Grains (Whole Grain Wheat (84.6%), Malted Whole Grain Rye (6.3%), Whole Grain Quinoa Flakes (3.2%)), Sugar, Honey (1.4%), Glucose Syrup, Peanuts (1.1%), Molasses, Natural Flavouring.